Recumbent exercise bikes stand tall among the many different types of exercise bikes. They’ve got lots of comforts to offer and sport different workout programs that make each workout less of a hassle. Getting the best recumbent exercise bike is a sure way of keeping your body well sculpted while getting great value for every penny spend. To be frank, getting the best in the world of recumbent bikes isn’t that easy. You’ve got to take different factors into consideration ranging from user comfort, a number of programs, to price. 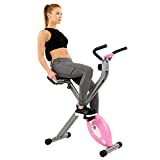 And it’s with such criteria that we’ve used to search the market and come up with the best recumbent exercise bikes that will revolutionize your workout experience. Sit tight and let’s review each bike stating the features that set them apart. 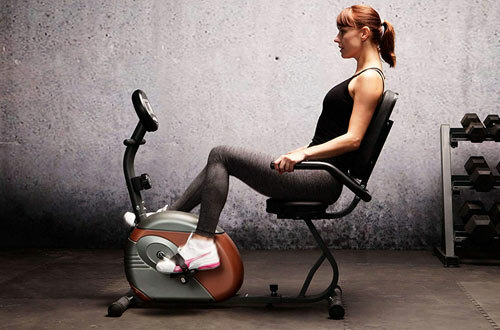 This exercise bike is designed to accommodate people of all sizes, thanks to its large cushioned seat. You can make some adjustment to the seat to fit users who are 5 feet 3 inches to 6 feet 1 inch tall. This bike makes use of a magnetic resistance that can be set to 8 different levels. And you get to monitor your workout progress in a user-friendly LCD display. The heavy-duty design makes it sturdy enough to support users up to 300 pounds. The bike folds to half its size for compact storage. 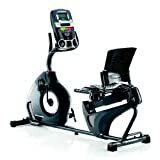 Get an easy time monitoring your workout progress with the widescreen LCD display that comes with this recumbent bike. And you don’t have to go through lots of trouble getting on and off the bike, thanks to its “Step Thru” design. The bike has 14 levels of magnetic resistance to choose from and fits users who are 5 feet to 6 feet 3 inches tall. The bike is designed for users weighing up to 250 pounds. This is a semi-recumbent bike that gives you an easy time getting on and off. It’s got a spacious cushioned seat that adjusts to accommodate users 5 feet 2 inches to 6 feet 2 inches tall. You’ve got 8 magnetic tension settings and a large LCD to display your workout progress. The bike comes in a foldable space-saving design and has a weight capacity of 300 pounds. Keep track of your workout via a dual LCD display integrated on this recumbent bike. With it, you get 13 different feedbacks. There’s 22 programs to choose from and 2 user settings that can be customized to your liking. The bike generates a smooth resistance that can be set to 20 different levels. Get an extra boost of energy with a fan that can be adjusted to 3 different speeds. This is a stable bike that’s got the capacity to accommodate users weighing up to 300 pounds. This recumbent bike comes with a redesigned console that’s made to be simpler. The console sports a dual track LCD display and lets you choose from 22 different programs. With this bike, you get 20 levels of resistance to increase the intensity of your workout. The set is vented, padded and contoured to maximize user comfort. And you get a strong frame that supports up to 300 pounds. You don’t have to worry about keeping cool since there’s a 3-speed fan designed for the job. Dig less in your pocket yet get a momentous workout experience provided by this recumbent bike. It comes lightweight and sports a “Step Thru” design for hassle-free mounting and dismounting. The padded seat adjusts to fit users who are 5 feet 3 inches to 6 feet 3 inches tall. You get to choose from 8 levels of resistance and monitor your workout progress via a user-friendly LCD display. The bike comes stable enough to support up to 300 pounds. Marcy ME 709 is a great choice for those that are a little bit tight on budget. This bike packs enough to ensure that you reach your fitness goals. It sports 8 preset levels of resistance and lets you keep track of your workout via a user-friendly LCD monitor. The bike provides the comfort of a padded seat and adjustable straps. It’s got a sturdy powder-coated steel frame to support up to 300 pounds. 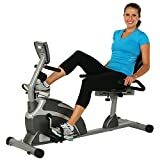 With this exercise bike from Phoenix, you can have an effective cardio workout whether it is in the basement or yard. It features an amazingly quiet operation and durable steel frame that can handle wear and tear. 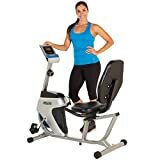 Thus, this makes an ideal bike for those who are still trying to have a feel of working out using this exercise equipment. In addition, this product comes with 8 resistance levels, which you can control manually using the hand dial. To keep yourself secure, you can use the bootstraps positioned strategically to the pedals. This brand of a recumbent bike can hold a maximum of 325 pounds, and it has a wide seat for any users’ comfort. It also comes with a special hand pulse pads, which is effective in targeting your heart rate zone. With its unique design, you can easily get on and off the bike after your workout. Hence, you will feel comfortable using this product that can keep you back in perfect shape. If you have a limited floor space at home, working out is still quite possible with a suitable exercise equipment. This recumbent bike has fordable features, so it is hassle-free to keep it when not in use. Furthermore, it has a magnetic resistance system that you can adjust anytime you want. The bike also displays key details you need to know during your workouts such as the calories burned, distance covered, time and speed. 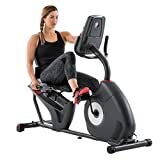 What’s particularly special about this brand of recumbent bike is the fact that it comes with the magnetic resistance system that provides you with a quiet and efficient workout. As you ride the bike, you can check the display monitor to learn more about the speed, time, and distance you have covered during your workout routine. It also has oversize pedals for ultimate comfort, as well as a durable frame to accommodate every user for a number of years. 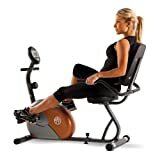 It’s a breeze to tone your buttocks, thighs and other problem areas in your body using this recumbent bike by Stamina. It offers a quick and simple cardio workout, and you can even fold it when you want to transport or store it. 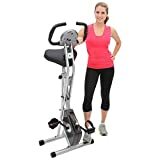 So, even if you have a cramped space at home, owning an exercise bike is not a problem because of this low-maintenance bike that is hassle-free to use. It also operates silently and has a cushioned backrest and seat.